On Dec. 6, the faithful commemorate a bishop in the early church who was known for generosity and love of children. Born in Lycia in Asia Minor around the late third or fourth century, St. Nicholas of Myra is more than just the inspiration for the modern day Santa. As a young man he is said to have made a pilgrimage to Palestine and Egypt in order to study in the school of the Desert Fathers. On returning some years later he was almost immediately ordained Bishop of Myra, which is now Demre, on the coast of modern day Turkey. The bishop was imprisoned during the Diocletian persecution and only released when Constantine the Great came to power and made Christianity the official religion of the Roman Empire. 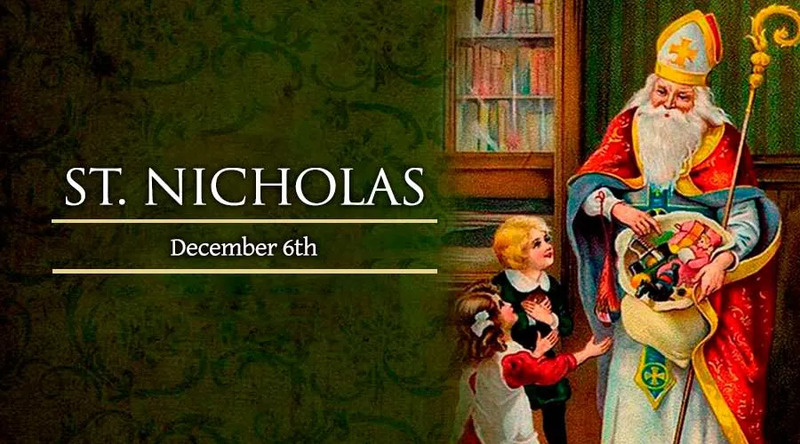 One of the most famous stories of the generosity of St. Nicholas says that he threw bags of gold through an open window in the house of a poor man to serve as dowry for the man’s daughters, who otherwise would have been sold into slavery. The gold is said to have landed in the family’s shoes, which were drying near the fire. This is why children leave their shoes out by the door, or hang their stockings by the fireplace in the hopes of receiving a gift on the eve of his feast. In the East, he is known as St. Nicholas of Myra for the town in which he was bishop. But in the West he is called St. Nicholas of Bari because, during the Muslim conquest of Turkey in 1087, his relics were taken to Bari by the Italians. St Nicholas is the patron of children and of sailors. His intercession is sought by the shipwrecked, by those in difficult economic circumstances, and for those affected by fires. He died on December 6, 346.